Visit our Directions page for a map with information about how to visit Annunciation Byzantine Catholic Church. 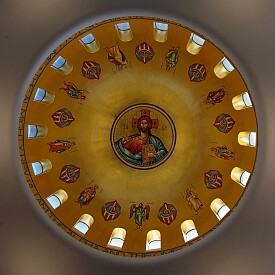 MOSAIC OF CHRIST THE TEACHER (PANTOCRATOR). In the ancient world, kings, emperors, judges and teachers would sit as they exercised their duties. The Scriptures, in general, see Christ as the promised successor of King David seated on his throne, and specifically, the book of Revelation sees Him and the Father as occupying thrones in heaven. This dazzling mosaic, made of thousands of pieces of miniature glass tessera, depicts Christ in His glory blessings with His right hand, while holding an ornate Gospel Book in His left. His Holy Gospel contains His words of eternal life that he bequeaths to his Faithful with the instruction, “Go therefore into all nations baptizing them, in the Name of the Father, the Son and the Holy Spirit.” We have been saved for a purpose: to be collaborators with our Lord Christ in the salvation of the world.